Scope: This page describes the process of getting yourself "joined" in the "Loyalsock 1966" Yahoo group. This Group is ONLY for members of the Loyalsock Class of 1966. Please try NOT to change your email address, so we can avoid repeatedly going through this process. Explanation: Due to Yahoo changes, the moderators can no longer "direct add" people like they could in the past. 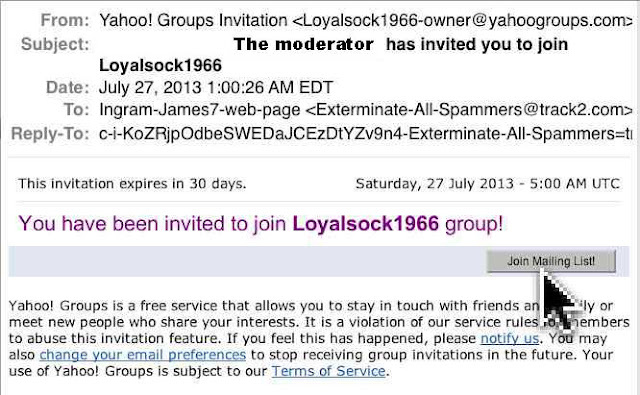 The moderator has to send you an "INVITATION"
You have to "accept the invitation" in order to join the group. Details below. Contact the Troubleshooter Pat Fullmer, or the temporary Moderator James Ingram (contact link at bottom), for an invitation. You will receive your invitation in the email. It should look like the following image. - Click the "Join Mailing List" button in the email you will receive. Clicking this button should open your web browser. Your web browser should display a "Confirmation Message", similar to the above message.